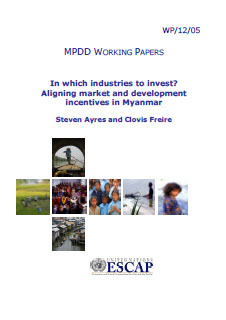 This paper argues that, with the removal of international sanctions and the opening up of the economy, fostering economic activity and facilitating investment in new and more productive industries will best facilitate inclusive economic growth in Myanmar. With a perspective that emphasizes the role of structural transformation, this paper presents a model describing how this can best be facilitated with the use of strategies that push towards diversification, particularly in the direction of more productive economic activities. It also presents a methodology to identify diversification opportunities based on trade data and presents a list of specific industries and products that will best contribute towards this process.